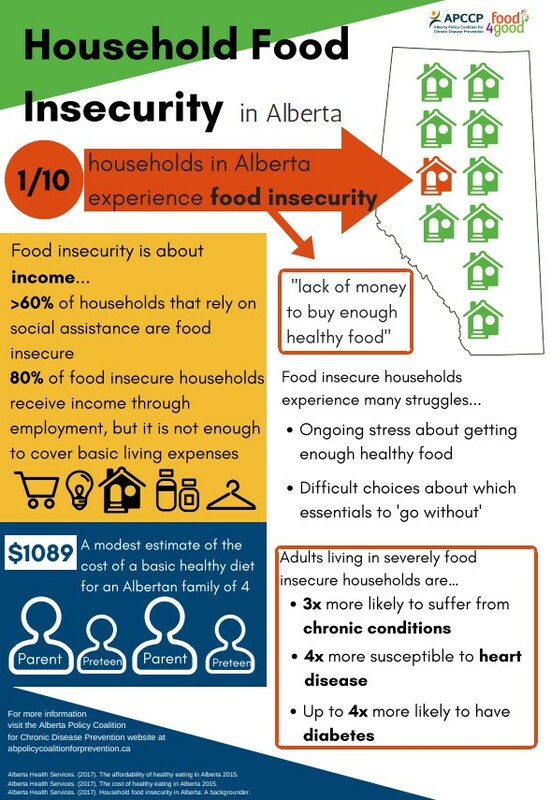 Household food insecurity – a lack of money to buy enough healthy food – is a serious issue in Alberta. More than 1 in 10 households in Alberta experience household food insecurity. Household food insecurity contributes to poor health, and at the same time, poor health puts households at greater risk for food insecurity. At the root, household food insecurity is an income-related issue. Addressing household food insecurity means ensuring all Albertans have enough money to meet their basic needs. In the summer of 2017, Food4Good teamed up with the Alberta Policy Coalition for Chronic Disease Prevention (APCCP) in Edmonton, Alberta to explore community perspectives on income-related responses to household food insecurity. Watch our video below to hear what community members had to say. Share some of these social media posts that ACCDP has created. Share our community video on Twitter and Facebook. Write a letter to your MLA. To find your MLA, click here. For a sample letter that you can use to email your government representative, click here. We strive to create neighbourhoods where food is a driving connector for learning, sharing, and celebrating together. The food and the ways in which we access it is healthy for our bodies, our communities and the earth!